Physical activity is important for a healthy lifestyle, but it can also put wear and tear on your knees. 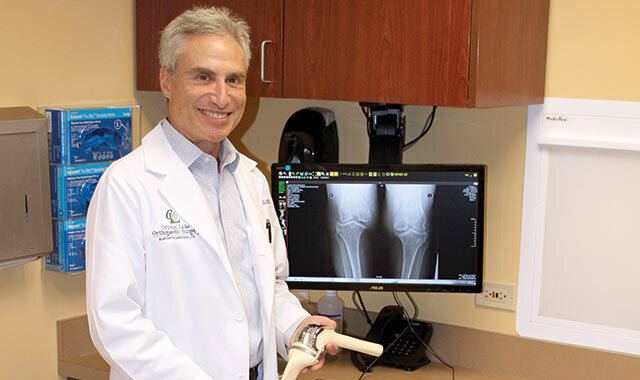 Dr. Steven Rochell, an orthopedic surgeon at Crystal Lake Orthopedics, 750 Terra Cotta Ave., Crystal Lake, and 12519 Regency Pkwy., Huntley, tackles a variety of joint-related conditions, from sports injuries to chronic ailments such as arthritis. It is possible to keep your knees healthy and pain-free, with some simple preventive techniques. Rochell offers five tips for keeping your knees in optimal condition. As you age, your muscles lose their strength. You also tend to lose your ability to balance. To improve your balance, a simple practice may be standing on one leg with your eyes closed. Exercising and eating well can help to sustain a healthy weight, which helps to avoid putting extra pressure on your knees. Regular activity such as walking, running, swimming and cardiovascular exercise can help to keep your weight in check. Too much of a good thing can be bad. Rochell sees many patients “overdoing it” with their physical activity. People who experience arthritic pain may need to avoid certain actitivies. Knee pain can happen for many reasons, such as joint degeneration, infections or even tumors. It’s important to see a physician if pain is persistent. If you do develop arthritis, proper knee function can be restored with complete or partial joint replacement. Alternatives to surgery that relieve pain and restore function include physical therapy, anti-inflammatory medications, injectable treatments and topical preparations. “The best treatment is always specific to the patient,” Rochell says. This entry was posted on Friday, September 25th, 2015 at 11:59 am	and is filed under Health & Fitness. You can follow any responses to this entry through the RSS 2.0 feed. Both comments and pings are currently closed.